According to the international research coalition Project Drawdown9, reducing food waste is the 3rd most impactful solution to global warming. California state law AB 1826 requires businesses with a minimum amount of organic waste, including food and food scraps, to recycle it -- rather than having it disposed in our landfills -- as of April 1, 2016. California state law SB 1383 requires that at least 20% of all currently disposed edible food is recovered for human consumption by 2025. It is heartbreaking to see men, women, and children go hungry in our community. And it is heartbreaking to see so much fresh, nutritious food go to waste. 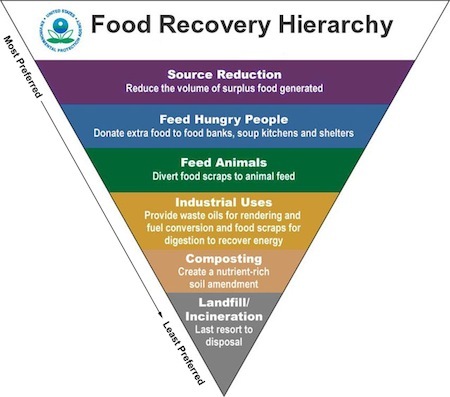 1 Natural Resources Defense Council, “Wasted: How America is losing up to 40% of its food from farm to fork to landfill,” 2017. 6 Bay Area Consumption-Based GHG Emissions Inventory, Bay Area Air Quality Management District, January 2016. 7 Marin Sanitary Service, personal communication, January 2014. 8 Marin Independent Journal, March 19, 2014. • At work: If you have excess edible food -- prepared food, produce, dairy, eggs, meat, packaged goods, baked goods -- contact us! If you work in a food-service business, the EPA has an extensive guide to reducing wasted food and packaging here. And if you're a Marin Sanitary Service customer, check out their food-scraps-to-energy program here. • At home: first learn the basics. Here's a good, 1-page overview and the NRDC's Dana Gunders has a great new book here. • Then: Get clear on food dating. Wondering how long food lasts, when stored properly, past the often-confusing "use-by", "sell-by" and "best-by" dates? Here's a great overview from the USDA. The NRDC explains in this article how confusing dates on food leads to waste and provides this infographic on organizing your refrigerator to reduce waste. And here's a brief TV news piece explaining that many foods last long after the date printed on their packaging when stored properly. This brief Wall Street Journal video is also helpful. Take a look at EatByDate.com's easy search tool here -- you can quickly look up any type of food and how long they say it will last when properly stored. (A handy infographic based on EatByDate.com's data is here.) You can also find guidelines on the shelf life of food at ShelfLifeAdvice.com. Have extra non-perishable items at home? Consider donating them to the SF-Marin Food Bank or starting a food drive. • At school: If you have excess edible food at your school, contact us! And here's a good infographic from the USDA on how schools can reduce food waste. • In a faith-based organization: Check out the EPA's resources for you here. And of course, if you have excess edible food, contact us!